Bianca Lebron and fellow fifth graders from Gomes Elementary School work on building wind turbine blades. This year the offshore wind company Vineyard Wind plans to start construction on a wind farm south of Martha’s Vineyard, with more than 80 turbines. Several other commercial wind-power projects are proposed for the state’s coastal waters. And while the first offshore turbine has yet to go up in Massachusetts, already this new industry is beginning to have an impact on local classrooms, from elementary grades to college. 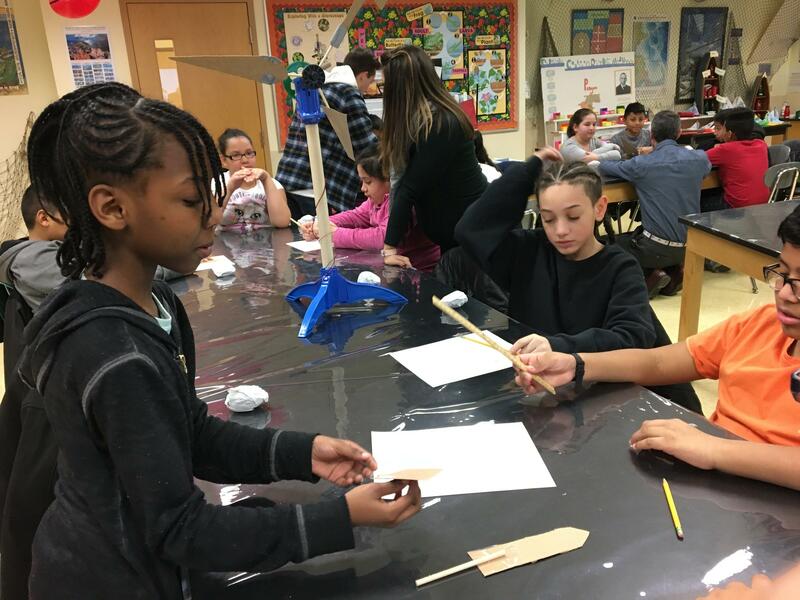 One recent morning at the Sea Lab Marine Science Educational Center in New Bedford, a group of fifth graders from Gomes Elementary School were putting together prototypes of wind turbine blades made from popsicle sticks and cardboard. Fifth grader Bianca LeBron worked with classmates on a design. "Maybe a smaller stick, because a larger stick doesn't seem to get a lot of wind power?" she suggested. On this day, she and her classmates were trying to design blades that would generate enough wind energy to power a small red light. Greg Pimentel who runs the offshore wind program explained to the class how they should think about blade designs. "A really important thing is the pitch of the blade, or the angle. Now, if I have my blade straight like this, is this going to catch wind and spin the turbine?" he asked the class. This is the first year that Sea Lab is running an official offshore wind program for students. "It's really important for my kids to learn about offshore wind because we live here in New Bedford, right on the coast, and this is something that's very current," teacher Kayla Fleurent Corey said. Though the fifth graders weren't sure if they wanted a job in offshore wind just yet, older students at Bristol Community College in Fall River are more seriously considering careers in the industry. The College is getting ready to offer the first accredited offshore wind degree in the state this coming fall, and professor Anthony Ucci said they’ve already gotten inquiries from interested students. "We're training them to be operations and maintenance technicians," Ucci said. "That is the long-term job that stays with the actual wind farm." The college saw an opportunity for a workforce pipeline in New Bedford. The program will include a general curriculum of engineering courses, but it’ll also have classes on marine safety and training on a mock wind turbine. "The fact is, there's essentially no offshore wind technicians in the country now, so we want to make sure those students are ready to go when that job gets there," Ucci said. But one challenge to the program is making the industry seem real to students. Ucci said in the past, the promise of other renewable energy industries in the area, like the failed offshore wind project Cape Wind, have come and gone. "Cape Wind is a real problem that we deal with," he said. "That was supposed to be a big project, supposed to employ a lot of people, and the fact that that didn't happen makes people believe that it's possible that other projects like it might not happen." But first year student Joseph Massi said this time around, he thinks things are different. He’s interested in a job in the offshore wind industry because now that the state has backed the construction of multiple offshore wind farms, it seems like the industry has gained a foothold. "Renewable energy as a whole, that's the future and that's where everything is going to be when the world takes notice," Massi said. "Once it starts booming in the U.S., that's going to be where you'll want to be as far as an engineer." Bristol Community College is also moving forward on a joint offshore wind program with the Massachusetts Maritime Academy in Bourne and with the Adult & Community Education of Martha’s Vineyard in the fall. And for fifth grader Bianca Lebron, at the Sea Lab classroom, she said there’s definitely something that peaked her interest in wind power. "We were learning about the wind and how fast it is, and it creates electricity, and it was pretty amazing," she said. The first commercial offshore windfarm is set to break ground at the end of this year with at least three more planning to follow. When they come online, the hope is there’ll be a workforce ready to keep the blades spinning. The Bureau of Ocean Energy Management (BOEM) wrapped up a two-day bidding process for three parcels of ocean to be developed for offshore wind farms, the highest grossing offshore wind auction to date. Governor Charlie Baker formalized his commitment to bringing the offshore wind industry to New Bedford on Monday, after signing a lease with offshore wind developer Vineyard Wind. The lease would allow Vineyard Wind to use the New Bedford Marine Commerce Terminal for 18 months, from 2020 to 2021, for staging and construction of offshore wind turbines before they are shipped out to the wind farm site roughly 15 miles south of Martha's Vineyard.